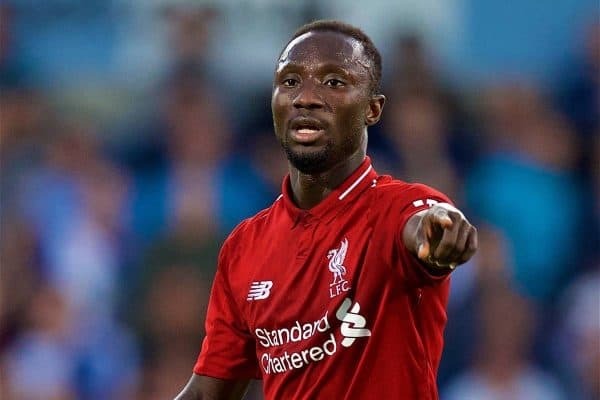 Will the real Naby Keita please stand up? It’s been a difficult first season for Naby Keita, but Chris McLoughlin still thinks the midfielder can have a big say in the final months of the campaign. Finished celebrating yet? Or are you going to make a weekend of it? You’ve got to enjoy these moments when they come around as maybe it’ll never happen again, not in our lifetime anyway. Anyway, that’s enough about Liverpool making a £125 million pre-tax profit, although paying £19 million in tax shows just how far LFC are lagging behind Amazon and Google. If only we could find loopholes off the pitch in the same way James Milner finds them on it, such as offside avoidance when the linesman is admiring Johann Lallana’s tekkers. Let’s be honest, reading about the Reds moving up to 7th in the Deloitte Money League is exceptionally dull and I’m yet to see any headlines claiming Man United have bottled it after losing top spot to Real Madrid, but the way that profit has been reinvested is more exciting. 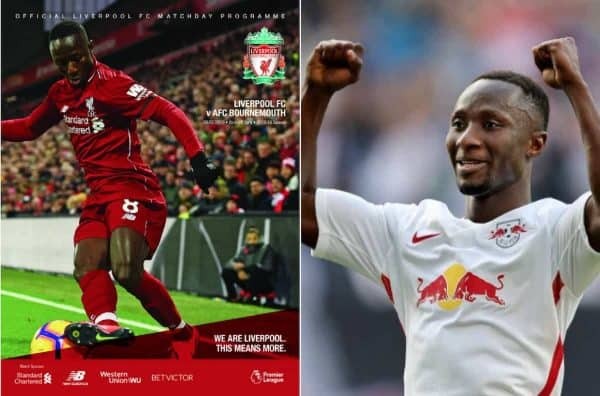 Just over £95 million of that £106 million profit was spent on transfer fees for Fabinho and Naby Keita. Chuck in signing-on fees, agents’ fees and a couple of pairs of gloves for when it gets a bit chilly and that’s probably the full £106 million, give or take. Good investments? The jury were last seen in the canteen. At the start of the season Keita looked like he’d be an immediate hit, not least after his performance away at Crystal Palace, while Fabinho looked like he might never get a game, starting just one Premier League game before Halloween, a night when kids go out dressed as Evertonians and knock on your door for money. Fast forward to the Saturday before St Clintontines Day and it now looks like Fabinho will be a mainstay in Jurgen Klopp‘s team while Keita is struggling for form and confidence (and to get a blatant penalty from Martin Atkinson) despite setting a new Premier League record on Monday night of 18 games without defeat, the longest individual unbeaten competition run since football was invented in 1992/93. So let’s focus upon Naby. Part of the problem Keita has got is that he had 12 months of hype and expectation to live to with his move from Toro Rosso Leipzig taking so long to complete. I’m not saying there were too many compilation videos of his goals, assists and dribbles doing the rounds on YouTube, but they’ve made less episodes of The Simpsons. He was never going to live up to those clips so soon and he hasn’t. 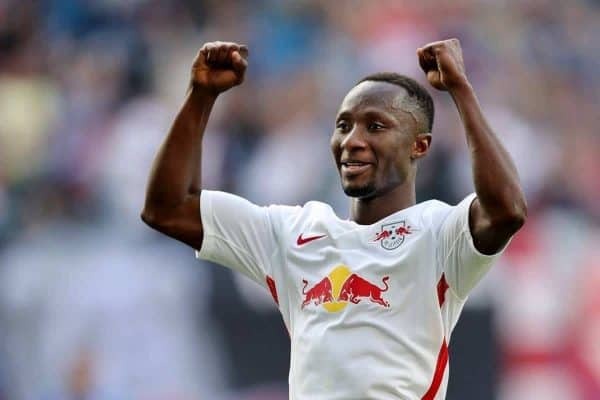 During that year-long wait I also sought out a fair few videos of RB Leipzig to see Keita in general play and it was evident that the biggest area he could improve on was not spending too long on the ball and learning to play the right pass at the right time. That, for me, is the issue holding him back now. I know a few fellas who think he doesn’t quite fit Klopp’s system at the moment. I disagree. 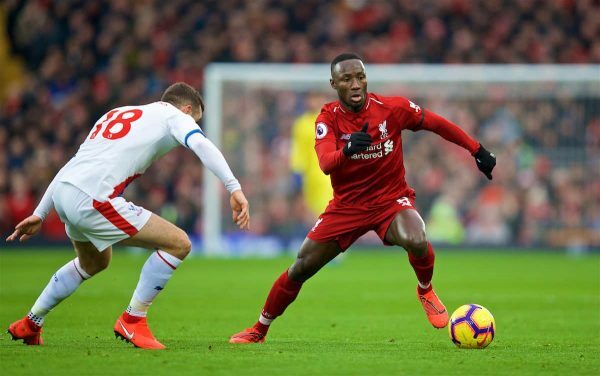 Not passing or shooting when he should and the inevitable grumbles that follow – from his manager, team-mates and supporters – can be a confidence-sapper and having interviewed Naby a couple of times he’s already a shy, quiet character who is still adjusting to life, and the language, off the pitch. Losing confidence on it isn’t helping him. What would do him the power of good is a goal. A big goal in a big game, a moment when his contribution makes a crucial, positive difference to Liverpool winning. I honestly think something as simple as that can transform Keita’s form and what better weekend for it to happen than his birthday weekend (he turns 24 on Sunday) against Bournemouth? Not only does Naby need a boost, Liverpool need a boost from him. I wrote at the start of the season goals from midfield could be a problem given that Philippe Coutinho, Emre Can and Alex Oxlade-Chamberlain contributed 23 of the Reds’ 27 goals from midfield last season and it remains an issue. Xherdan Shaqiri (6), James Milner (5), Gini Wijnaldum (1) and Fabinho (1) have provided 13 goals but Keita, Jordan Henderson and Adam Lallana have yet to net. That must improve. Keita also told me he compares his season-by-season performances rather than comparing himself to other players. Failing to have scored when he got six, 18, eight and nine goals in his previous four seasons will be gnawing away at him but at this point of the season, with the results of both Liverpool’s Premier League and Champions League matches during the next month either going to set us up for quite a run-in or be season-destroying, Klopp needs his £52 million man to come good now. * Chris McLoughlin writes for This Is Anfield each Friday; he’s also senior writer for the Official LFC Matchday Programme and LFC Magazine. You can order the Liverpool v AFC Bournemouth programme here.